Yorkstone riven paving also known as yorkstone flags or flagstones are natural paving stones quarried from the Yorkshire area, yorkstone riven paving is a sandstone paving of very high quality. Due to this high quality yorkstone flags have been used as paving in most of the major towns and city’s in the UK. Yorkstone riven paving is generally used for exterior paving projects but is also used as interior flooring because of it’s range of natural colours. Yorkstone riven paving has varying natural colour’s from sandy yellows through to greys and browns due to the amount of iron oxide present in the formation of yorkstone flagstone blocks. Yorkstone riven paving flags are usually made in random sizes due to the natural shape of the yorkstone flagstone blocks. The flagstones can be made to specific widths and lengths (gauged) depending on the type of paving patterns you want to create. 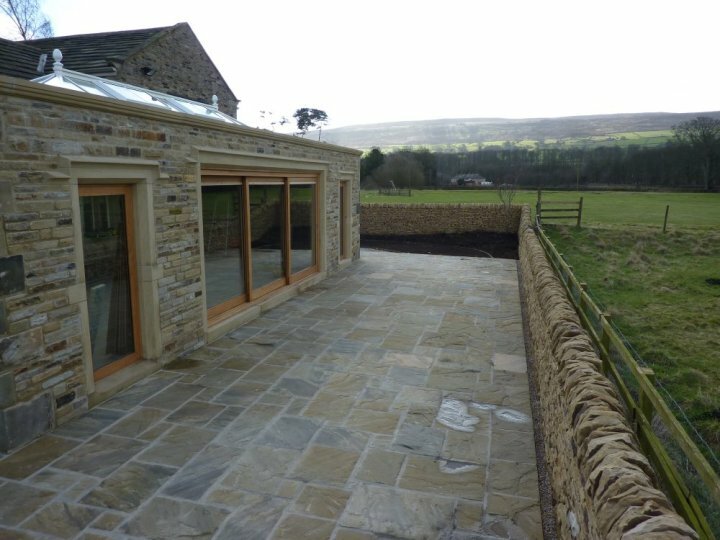 Yorkstone flagstones are generally 40mm – 60mm in thickness but can be made to any thickness required due to the way the flagstone blocks are formed. The paving flags can also be cut to form shapes like paving circles or European fan patterns. Yorkstone riven paving is usually graded from, the hard sandy yellow colour with dressed or fettled edges with gauged widths and gauged lengths being the top grade and the most expensive, down to the softer brown ‘self faced’ paving with sawn edges and random widths and random lengths being the lowest grade and the cheapest price. The term self faced comes from the way the paving is easily peeled from very loose natural beds, the loose beds are much easier to rive apart than the harder layered beds of the fettled flags. The loose self faced beds are usually reddish brown in colour, just like the colour of the outside of the blocks before they are quarried. Laminating yorkstone paving should be avoided when looking for yorkstone riven paving, laminating is when the paving flags are splitting on their own or have very loose beds that look open. The loose beds will probably split when the paving stone dries out. laminated flags are sometimes made from soft silty layers that have not compressed enough. laminating is also caused by frost damage to the exposed blocks before they have dried inside. Sometimes the laminating blocks can be used for self faced paving usually for interiors projects. To watch more yorkstone paving videos, click on the links below. This entry was posted in Paving. Bookmark the permalink.